Y’all, this stuff is insane!! 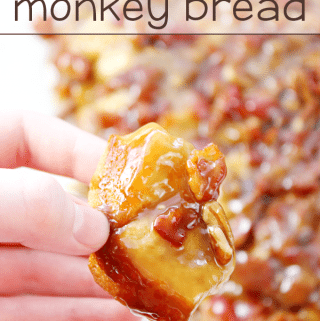 My boys devoured the entire pan of this Maple Bacon Monkey Bread without even batting an eye – it’s a good thing they at least let me get pictures before they inhaled it! 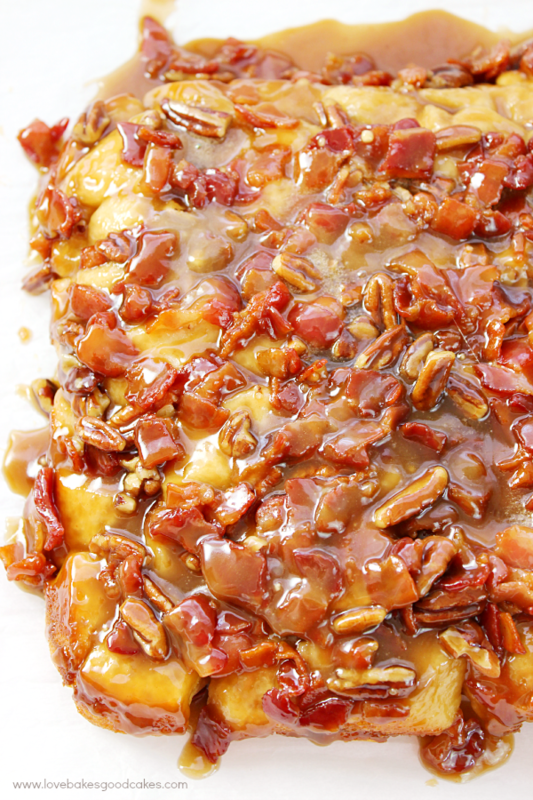 Of course, when you combine maple syrup, bacon, pecans – you know it’s going to be good! 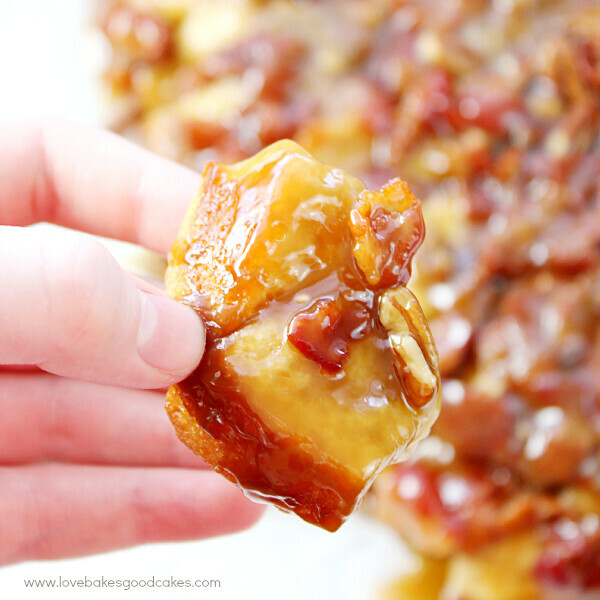 Lawd have mercy, just look at all those biscuit pieces drenched in maple syrup and covered in bacon and pecans!! Swoon!! 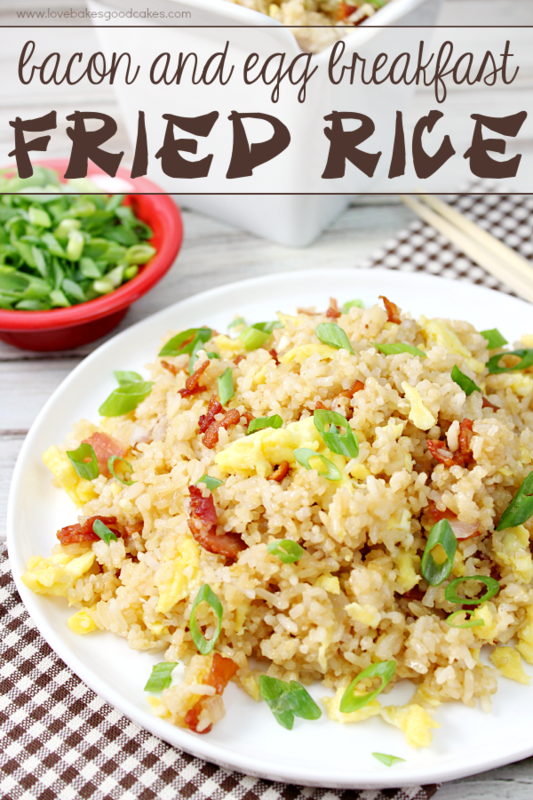 I did get to taste a corner piece before it disappeared and I can’t wait to make this again!! As it was baking my kiddos were coming into the kitchen like vultures wanting to know what I was baking – so be warned, it won’t last long! Although monkey bread is usually made in a bundt pan, I went with a 9×13-in baking pan for this recipe. I wanted to make sure there was a good biscuit ratio to all the yummy toppings! I don’t have a platter large enough to hold this, so I used parchment paper and grabbed my largest cutting board. 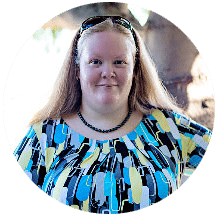 Be super careful flipping this over – I almost dropped mine!! Eeek! Although my family totally digs the bacon with the biscuits, some of you may think it’s a bit weird. 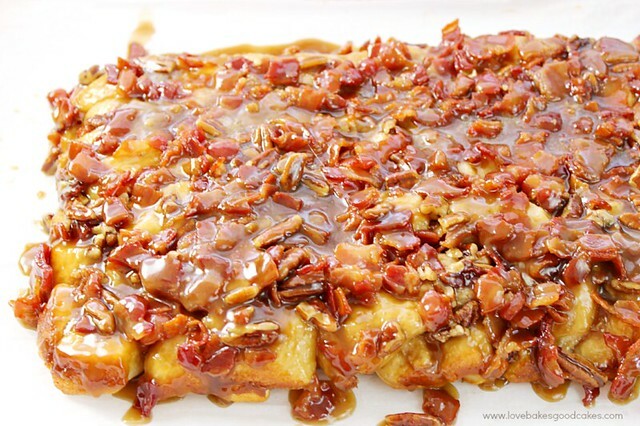 I think it would be equally fantastic without the bacon and just with the maple and pecans! Preheat oven to 450°F. Grease a 9x13-inch baking dish or spray with cooking spray and set aside. In a medium saucepan over medium-low heat, cook the maple syrup and butter until the butter is melted. Add the brown sugar. Stir until well combined. Slowly add the flour, whisking well between each addition until all of the flour has been added. Remove sauce from heat and add the vanilla. Pour sauce into the prepared pan. Sprinkle the cooked and crumbled bacon evenly over the top of the sauce in the baking dish. Sprinkle pecans evenly over the top. Top with quartered biscuits. Bake for 15-17 minutes or until the biscuits are cooked through and golden brown and the sauce is bubbly. Remove from the oven. Cover with serving dish. Quickly and carefully invert the biscuits out onto the serving dish. While the sauce is still hot, scrape any sauce still in the baking dish out over the biscuits. Cover and refrigerate any leftovers. Reheat any leftovers before serving. 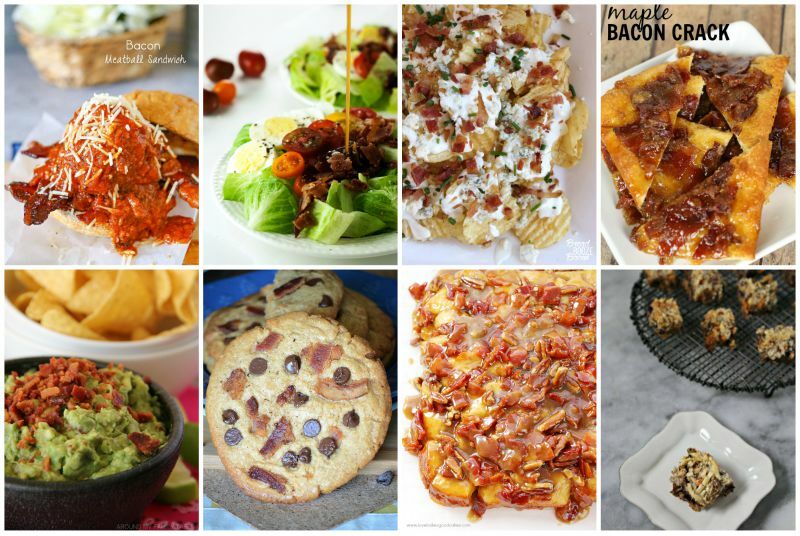 Check out what some of my bloggy friends made today for Bacon Month! Um, yes please! This is happening soon! I want and need this bread in my life! Seriously bacon month has been good to you! Holy crap! Jamie! I am going to gain ten pounds just looking at this, and you know I am going to make it, and eat it all. And not share with my family. I wouldn't be able to be left alone in a room with this stuff — seriously! It looks incredible! 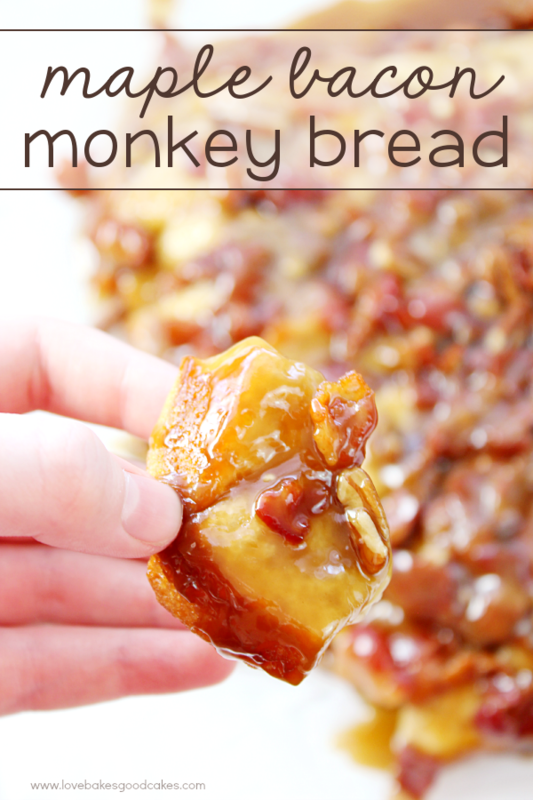 There is NOTHING like maple bacon…..and in monkey bread!? This is genius!!!! I made this today for my annual bacon day my family does! 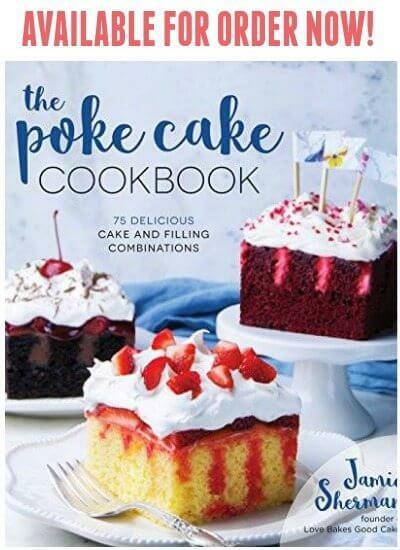 It's a huge event and this was a big hit! I feel like it was a nice balance with the bacon maple and pecans. I might have made more sause though. 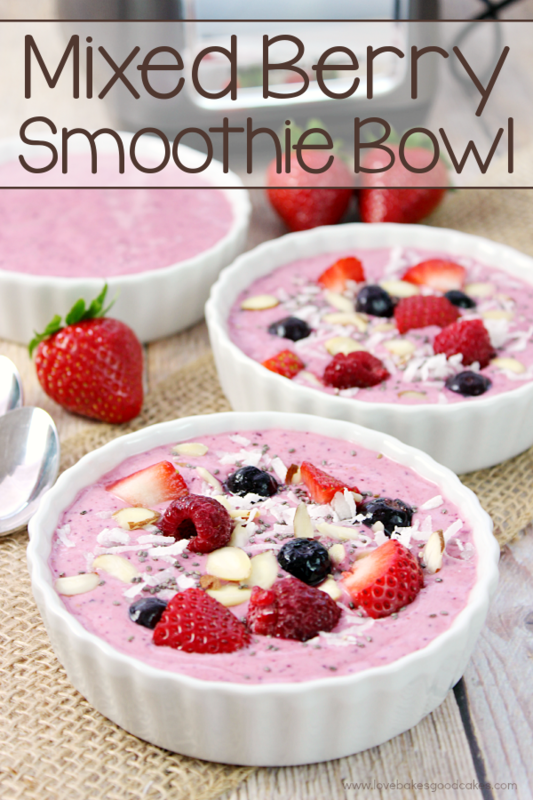 It was super yummy overwell and super quick to make. I will definitly keep this for Bacon Day 2017.